On Tuesday Apple announced record quarterly revenue of $46.333 billion and record eps of $13.87 in the December quarter. The 73.2% rise in revenue and 115.7% rise in earnings per share were fueled by strong domestic demand for iPhones, iPads and Macintosh personal computers and by gross margin in the quarter of 44.7%. In announcing the company's FQ1 results for the 14-week period, Apple offered revenue guidance of $32.5 billion for the 13-week quarter ending March 31, 2012 and earnings guidance of $8.50 per share. Management's guidance suggests revenue growth of 31.75% and eps growth of 32.8%. Once again, Apple's guidance will be proven decidedly conservative. Apple's 73.2% revenue growth in the December quarter was aided by a 14-week fiscal period encompassing the immediate post-Christmas shopping week and extraordinary revenue growth in Apple's Americas region, exclusive of the company's retail stores. The Americas delivered 92% revenue growth to $17.714 billion, representing 38.2% of total reported revenue on strong sales of the Apple iPhone 4S. Despite the well publicized economic problems in Europe, the region turned in a strong revenue growth rate of 55% for the quarter. Apple's Asia-Pacific region, absent the release of the iPhone 4S through an authorized carrier on China's mainland, turned in a respectable 54% revenue growth rate. The Asia-Pacific region will be the catalyst for robust revenue and earnings growth in the March quarter. In a recent article titled Where Apple Makes Its Money, I suggested the Asia-Pacific region will surpass Europe as Apple's second biggest revenue region this fiscal year. In FY2011, China was the only country outside the US to deliver more than 10% of Apple's reported revenue total. The release of the iPhone 4S on China's mainland in the March quarter will generate greater than 100% revenue growth in the Asia-Pacific region in this three-month period. In the December quarter Apple defied skeptics who questioned the company's ability to ramp iPhone supply to meet demand. In the holiday quarter iPhone unit sales rose 128% to 37.044 million units and handset sales revenue, inclusive of accessories and related products, rose 133% to $24.417 billion or 52.7% of the company's total reported revenue. In the March quarter, the rate of iPhone unit sales growth may again reach triple digits due to the China iPhone 4S rollout and the company's proven ability to meet demand for product. At the end of the December quarter, the iPhone's global channel supply of about 6 million units represented less than three weeks of December quarter sales and was well below the targeted range of 4 to 6 weeks of supply. In addition to the expected strong iPhone sell-through in the March quarter, Apple can add millions of units to channel supply before the end of the period and in support of the continuing global roll out of the iPhone 4S handset. For the March quarter, I'm targeting iPhone unit sales of 36 million units. In FQ1, Apple sold 15.434 million iPad units and sell-through was slightly higher than reported sales. This represented 111% unit sales growth even as consumer expectations for a product line refresh to occur in the March quarter continue to grow. During the conference call with analysts following Tuesday's earnings release, management mentioned the iPad's fast adoption in the education market. With the prospect of the iPad 3's release in the March quarter and the chance the iPad 2 will remain a shipping product, Apple could deliver in the area of 200% iPad unit sales growth in this fiscal period. Education channel sales will be an iPad unit sales growth catalyst in the upcoming June quarter. The Mac's unit sales performance exemplifies the "Apple product mutual halo effect." Record Apple retail store traffic following the release of the iPhone 4S in October assisted in boosting December quarter Mac unit sales 26% to 5.198 million units. 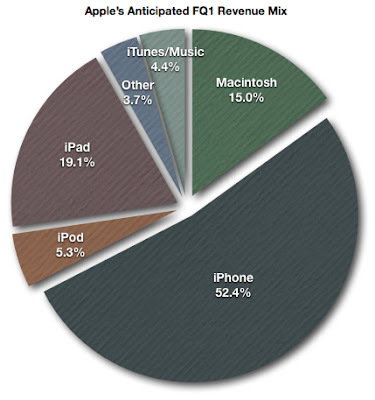 In the Asia-Pacific region Mac unit sales rose 58%. I expect March quarter Mac unit sales of about 4.7 million. Both the Asia-Pacific region and the Apple retail segment will be unit sales growth leaders in this three-month period. My preliminary March quarter revenue estimate stands at $41 billion, representing anticipated revenue growth of 66% and an earnings per share growth rate of about 80% to $11.50. Apple's guidance for the quarter of $32.5 billion in revenue and eps of $8.50 is consistently conservative. I currently expect Apple to beat guidance by $3 per share. For the fiscal year ending in late September, I now expect revenue exceeding $175 billion and earnings per exceeding $50. FY2013 is on track to be a more than one-quarter trillion dollar revenue year. Over the next two weeks I will be updating my current 12-month price target of $640. I expect the updated price target to land in the vicinity of $700 per share. Apple's gross margin in the December quarter reached 44.7% and net income reached nearly 28.2% of revenue. I expect gross margin and the percentage of revenue that flows to the net income line to remain high through the March and June fiscal quarters due to the continuing global roll out of the iPhone 4S handset. For as long as revenue growth rates remain greater than 50%, the percentage of revenue consumed by operating expenses will continue to decline. In the December quarter operating expenses came in at $3.363 billion or just above 7.25% of reported revenue. The declining percentage of revenue consumed by operating expenses contributed to the very strong net income growth in the quarter and will contribute to extraordinarily high net income growth rates this fiscal year.